(Drew this several weeks ago when I first heard the news, the day I got back from Europe). It's less a cartoon, and more an angry illustration trying to cut through all the mainstream media crap about how he was a so-called "controversial abortionist." In simplest terms, many of those who came to George Tiller's clinic for late second or third trimester abortions were women (and their partners) who were carrying much wanted pregnancies that had gone horribly wrong. These were women in many cases who had already set up cribs and had baby showers. Some of these women had fetuses with heartbreaking anomalies, that were discovered only later in pregnancy, such as anencephaly, a lethal birth defect in which most of the brain and parts of the skull are missing. Other women had themselves become very ill in the course of a pregnancy, such as the onset of cancer, which demanded a course of chemotherapy. Tiller, himself a practicing Christian, had set aside a space in his clinic -- a Quiet Room -- for grieving parents, who could if they wished, be counseled by a chaplain on staff, and participate in a baptism or other blessings for the lost pregnancy. In a perceptive piece written immediately after Tiller's death, the journalist Michelle Goldberg points out the irony that many of the procedures that he performed, for wanted pregnancies that had gone terribly wrong, "are as far away from the much-reviled concept of 'abortion on demand' that one could get... Almost anyone of childbearing age could end up needing Tiller's services." Thanks to the assassination of George Tiller, I have become a believer in late-term abortion. who was assassinated on May 31 in Wichita Kansas. 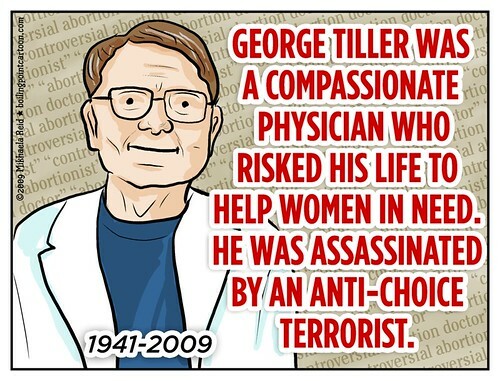 Dr. George Tiller sacrificed his life to save women's lives. He was one of the very few doctors in North America willing to help women who found out late in pregnancy that their baby would not survive outside the womb, and women whose lives and health were endangered by the pregnancy. For this, he was revered by his patients and the abortion provider community, who called him Saint George. Dr. Tiller lived his favourite mottoes "Trust Women" - and "Attitude Is Everything." He knew that women needed his help, and this gave him the strength and grace to continue his work despite the 30 years of relentless anti-abortion harassment and terrorism directed at him and his clinic. I knew that Tiller was providing life saving services for these women but I did not know his compassion extended to having on site counseling and a grieving room. Pro lifers often forget or do not consider that pro choice does not mean pro abortion...its a tough decision for many women and not taken lightly.